IBM is buying object storage startup Cleversafe for an undisclosed amount of cash or shares. Why? Big Blue says the deal will enable it to "support clients' drive to next-generation mobile, social and analytics applications." It will integrate the Cleversafe dsNet software portfolio into its Cloud business unit with on-premise, cloud, and hybrid cloud deployment options. It says the software allows companies to store and manage massive amounts of data more efficiently while meeting the demands of data-intensive workloads delivered via the cloud. Robert LeBlanc, IBM Cloud SVP, had a prepared statement about this: "A massive digital transformation is underway as organizations increasingly turn to cloud computing for ... ways to manage more complex business operations and increasing volumes of data ... Cleversafe will ... [help] clients overcome these challenges by extending and strengthening our cloud storage strategy, as well as our portfolio." Cleversafe was founded in 2004 and has more than 350 patents for its on-premises object technology that can scale to store multiple petabytes of data and billions of objects. It claims several 100PB-plus customers and one heading toward 1,000PB – an exabyte. 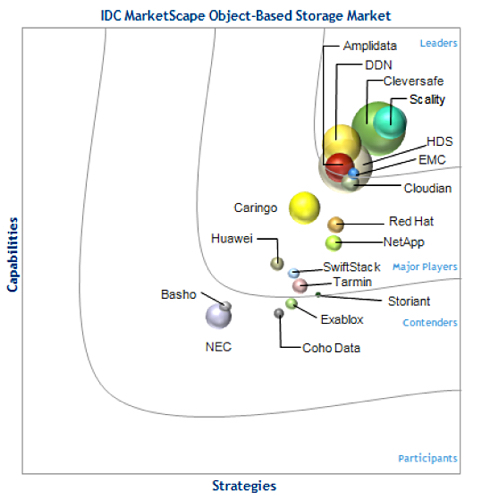 The IDC object storage marketscape positioned Cleversafe and Scality as the two market leaders in 2013 and 2014. Scality is heading towards a 2017 IPO after picking up $45 million in D-round funding recently. Overall funding is $135.4 million through five rounds, the last one being $55 million in 2013. It has a reselling deal with HP, which we reckon will now effectively or formally lapse – pleasing Scality, another HP object storage reselling deal partner, much more. Where does the cloud come in? Cleversafe's dsNet has Amazon S3 and OpenStack Swift support. Through a reselling deal with Ericcson, Cleversafe is the foundation of Ericcson's Secure Cloud Storage. IBM's cloud BU will integrate the dsNet tech "into the IBM Cloud to enhance IBM's Infrastructure as a Service, SoftLayer and the SoftLayer Object Storage services platform, providing clients a hybrid cloud deployment model that offers greater choice of geography, performance, cost optimization, and flexibility." Clients will be able to use SoftLayer cloud services and IBM Bluemix, IBM's Platform-as-a-Service, to create dynamic and innovative applications with the Cleversafe technology as a foundational content repository and data archive. IBM says that the Cleversafe technology complements its Spectrum Storage portfolio for data protection and backup, tape archive, as well as a high-performance file and object solution, Spectrum Scale (GPFS), where the focus is on response time. The pace of consolidation in the object storage business has been paralyzingly slow. HGST bought Amplidata, another object storage startup, in March this year, to power its Active Archive array. NetApp bought Bycast in 2010 and sells the technology as its StorageGRID offering.